mpgedit is an MPEG 1 layer 1/2/3 (mp3), MPEG 2, and MPEG 2.5 audio file editor that is capable of processing both Constant Bit Rate (CBR) and Variable Bit Rate (VBR) encoded files. mpgedit can cut an input MPEG file into one or more output files, as well as join one or more input MPEG files into a single output file. Since no file decoding / encoding occurs during editing, there is no audio quality loss when editing with mpgedit. When editing VBR files that have a XING header, mpgedit updates the output file's XING header information to reflect the new file size and average bit rate. 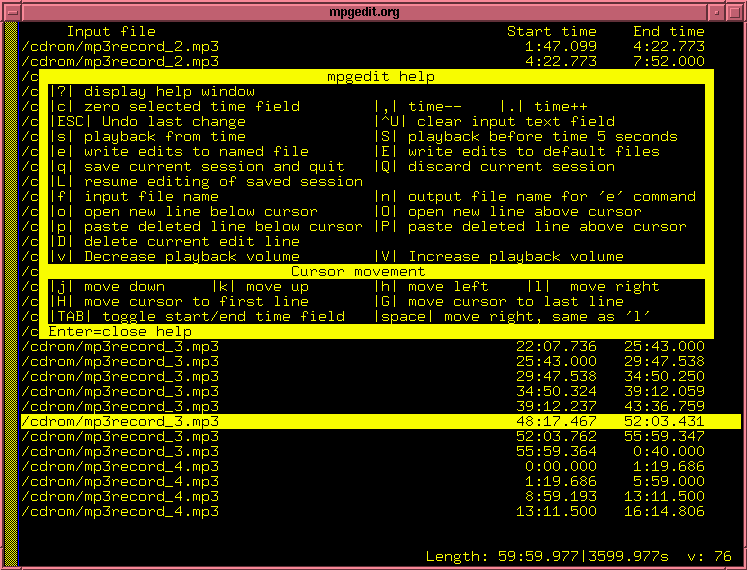 mpgedit operates in two modes: a command line and a curses-based, full-screen interactive shell. All editing functionality is available in both modes. The chief advantage of the interactive mode comes when using the playback feature for selection and verification of edit begin and end times, which is more rapidly performed interactively. 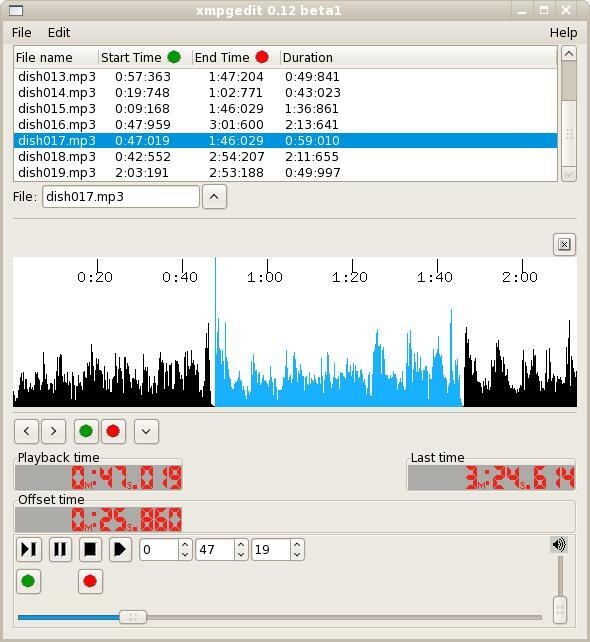 xmpgedit provides most of the same editing capabilities as the curses-mode mpgedit, but adds a graphical representation of the volume levels of mp3 file being being edited. mpgedit 0.75 dev2 is released! (4/13/2009). Updated build to support GCC 4.4. The last stable production mpgedit release is found here: mpgedit 0.74 beta1 . Note: The curses and command line versions of mpgedit for Linux are both included in the tarball distribution. This development toolkit enables Python developers to utilize the core mpgedit API, providing access to mp3 file playback, editing and indexing functionality. This extension uses the Python ctypes module to wrap the mpgedit core v0.73. View the complete py_mpgedit extension API documentation.